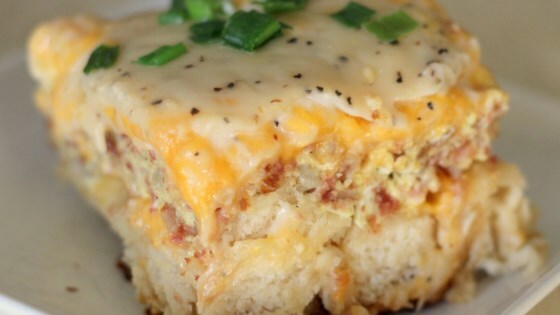 "This cozy casserole is sure to please--biscuits and gravy, eggs, and corned beef hash in one easy dish!" Preheat oven to 350 degrees F (175 degrees C). Spray a 9x13-inch baking pan with non-stick cooking spray. Cut biscuits into quarters; arrange them to cover bottom of prepared baking pan. Bake in preheated oven until biscuits have started to cook but are not done, about 5 minutes. Sprinkle with 1/3 cup shredded Cheddar cheese. Whisk eggs, milk, salt, and black pepper together in a mixing bowl. Place a non-stick skillet over medium to medium-high heat. Spoon in the corned beef hash. Cook and stir until hot and beginning to crisp up, 5 to 8 minutes. Remove from heat. Pour in egg mixture and continue to stir until eggs have started to cook but are not set, about 30 seconds. Spread egg and hash mixture evenly over biscuits. Sprinkle with remaining Cheddar cheese. Spread prepared country gravy over the top and bake until cooked through, about 45 minutes.